The Mughal gardens are the few number of gardens built by the Mughals in the Islamic style of architecture in India as well as other countries. Most famous Mughal Gardens of India are the garden of Taj Mahal, the Red Fort garden in Delhi, Agra Fort and Humayun’s Tomb Garden. Other Mughal gardens are Tomb of Safdarjung,Mehtab Bagh,Roshanara Bagh,Khusro Bagh and Ram Bagh. 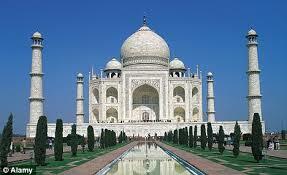 The Taj Mahal complex is sorruned by charbagh or Mughal garden between the tomb and gateway. The charbagh garden uses pathways to divide each of the four quarters of the garden. The Rashtrapati Bhavan garden or presidential gardens is situated at the backside of the Bhavan and open to public in February every year. The Mughal Gardens is the most beautiful gardens of India and feature a vast variety of flowers. The Char Bagh garden is a design typical of later Mughal gardens located at Delhi, Humayun’s tomb garden was the first garden-tomb on the Indian subcontinent. The charbagh complex is located at north of the Taj Mahal and the the Agra Fort, opposite side of the Yamuna River in Agra. The garden complex is perfectly aligned with the Taj Mahal on the opposite bank. The terraced Mughal garden is located on the eastern side of the Dal Lake near Srinagar and second largest Mughal garden in the Valley of Kashmir. The Brindavan Gardens is one of the most beautiful garden in India, lies next to the Krishnarajasagara dam built across the Kaveri river near the city of Mysore. The Mughal style garden is one of the major attractions and visited by 2 million tourists per year. The Mughal garden is located near Srinagar city and linked through a channel to the northeast of beautiful Dal Lake. The Bagh is considered the high point of Mughal horticulture. The Pinjore Gardens is known as Yadavindra Gardens, located in Pinjore, Panchkula district of Haryana. The Mughal Gardens is lie 22 km from Chandigarh, built by Patiala Dynasty Rulers. Verinag is a small town in Anantnag district of Jammu & Kashmir and also the first tourist spot of Kashmir Valley, lies at the entry point to the Valley right after crossing long Jawahar Tunnel. Verinag Spring and the beautiful garden are the major tourist attraction of this place. The large walled garden is located near the Allahabad Junction Station,surrounding the tombs of Khusrau Mirza. It is one of the public park and one of the popular tourist destinations in Allahabad. Get the latest updates, tickets fares and offers on best amusement park in Hyderabad. Stay tuned our social media channels for the wild waters latest offers.